When my husband and I changed our diet to include whole grains, one of the changes we made was switching from white rice to brown. White rice has been stripped of a good portion of its nutrients and contains less fiber. Brown rice has a slightly nutty flavor, and like other whole grains, is more filling than its white counterpart. You can read more about the comparison between white and brown rice by clicking here. 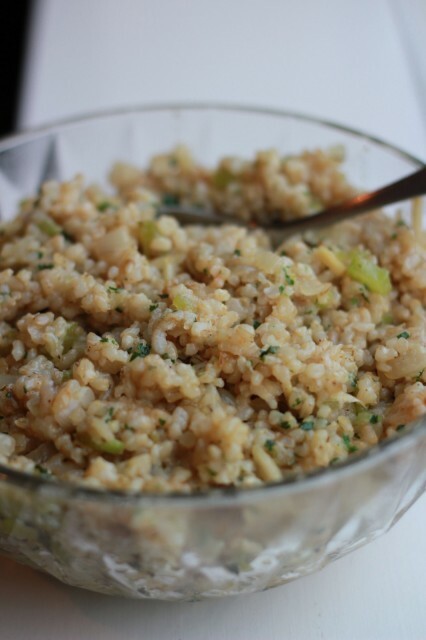 I created this rice pilaf recipe out of a desire to put a little pizzazz into plain brown rice. This is the perfect recipe to introduce friends or family members to brown rice if they are used to eating white. Add olive oil and butter once the skillet is hot. Once the butter has melted, add the onion and celery and cook until the onions become translucent and the celery begins to soften, about 8-10 minutes. Add the almonds and stir frequently until they are lightly toasted. Add chicken base and seasonings and stir until dissolved. Add rice and thoroughly mix together until heated through, about 5 minutes. Stir in fresh parsley and serve. What is your favorite way to eat brown rice?